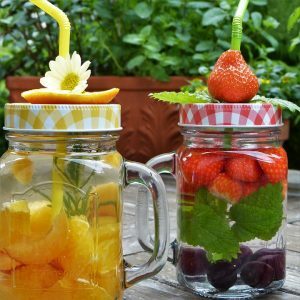 Infused water is the process of adding fruits, vegetables, and herbs to your water, then letting these ingredients flavor the water. In addition to providing a delicious flavor with a wide range of combination options, you also get some of the nutrients from the produce and herbs, which further improves how healthy your water is. Infused water is easy to do, but there are a few things you should know first. Here are some things to keep in mind when you are making your infused water. 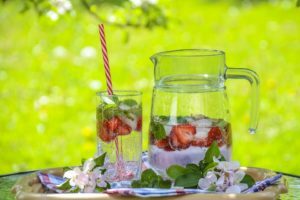 The first thing you should know about making infused water is that filtered water is always better. Filtered water is cleaner, so this is really going to improve the overall quality and flavor of your infused water. Since not everyone has access to enough filtered water to fill infused water pitchers every time, tap water is okay when necessary, but do try to get filtered water if at all possible. When choosing your water, you should only use room temperature or cold water. Avoid warm or hot water, since it can cause the produce to fall apart at a rapid rate, which reduces how many nutrients are going to end up in your water. If at all possible, try to select organic fruits and vegetables. These can often be found in the produce of your supermarket, but a better option might be to get them from a weekly farmer’s market, or by contacting local farmers directly. This allows you to get fresh fruits and veggies that you know were grown locally without added fertilizers and other chemicals. Organic produce does tend to provide a better flavor for infused water. However, the most important part is having healthy water with your favorite fruits and veggies, so if you can’t use organic, don’t worry too much about it! 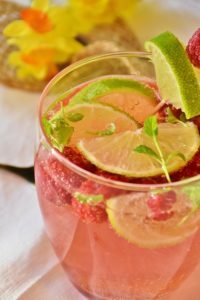 After you select the ingredients you want to use for your infused water, you will then need to prep them before putting them into the pitcher. You should always rinse the fruits and vegetables to make sure no chemicals are left on them. Even if you bought them organic, it is still a good idea to rinse them and make sure they are clean. If you are using herbs, you want to crush them with a muddler (or mortar and pestle), since this will help to release the oils. The exception is when the herb is leafy, such as with mint or basil. Most fruits and vegetables need to be cut at least in half before being put in the pitcher so that they can release their flavors. Hard fruits and vegetables like cucumber and apples need to be cut into thin slices since they can take longer to release flavor to the water. With berries and citrus fruit, they are softer, so just cutting them in half or quarters should be fine. By this point, you are ready to start putting your infused water together. Before you add in the water, make sure you have the right container. While you can technically use anything, a glass pitcher is usually recommended. However, regardless of which way you go, make sure it is BPA-free and food-safe. Many plastic pitchers are not ideal and won’t keep the water fresh, but in the end, it is really up to you. There are also pitchers and cups used especially for infusing. They typically have a long and narrow section in the middle where you put your herbs and fruit, with holes or slots so the flavor can be released. You can use these, but they aren’t necessary. When making infused water, you will add the produce and herbs first, then add your room temperature or cold water on top. You then want to let the water infuse so that you can get good flavors and nutrients from the fruits and vegetables being used. If you are leaving it out on the counter, this is usually done in about 2 hours. Otherwise, wait 4-6 hours if keeping it in the refrigerator for the infusing process. If you leave it overnight, it will be super flavorful. The ideal time to drink infused water is within 24-48 hours after the infusing process is complete. It is usually best to drink it the same day, but at least try to drink it within the first couple days. Waiting 3 days is okay, but don’t leave it for longer than that. Make sure you are not leaving the fruits and vegetables in the water for this long though. They should be removed and only the water should remain in the pitcher for this long. Citrus fruits will remain fresher for longer, while melons are going to get soft and mushy quickly. Also keep in mind that if you drink the infused water the same day, you can usually refill it 2-3 times with the produce in the pitcher or cup and still get good flavor from it. Enjoy! Say, do you love learning about health and would enjoy becoming a Certified Health Coach from a Biblical Worldview? Join the thousands who have discovered the difference learning health coaching from a BIBLICAL worldview can make.